One of the few, humorous bright spots in the last week was John McCain’s interview with C-SPAN3 on the Vietnam War, during which he criticized affluent American citizens who got out of their tours of duty by handing in doctor’s notes. 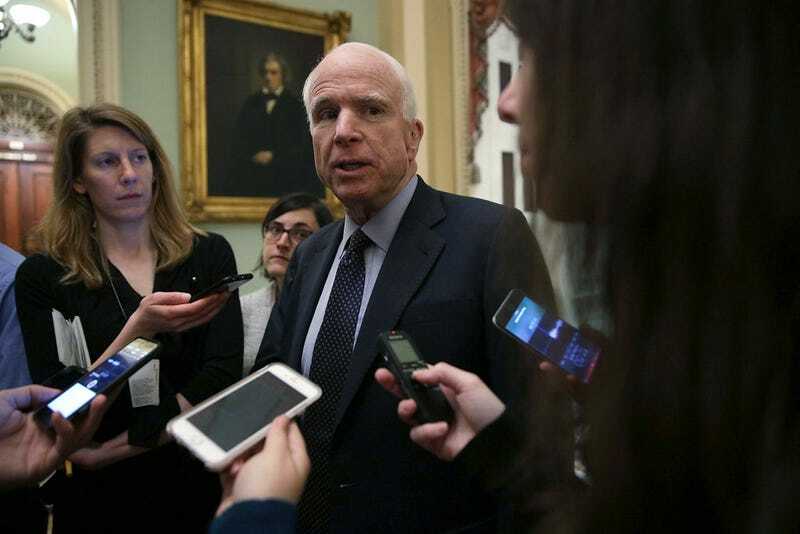 The Arizona senator didn’t word his comments in that exact manner, of course, but given his recent remarks about the dangers of “half-baked, spurious nationalism,” he certainly seemed to be trashing Donald Trump in the process of calling out draft dodgers. McCain specifically cited “bone spurs,” which were one of the ailments cited in Trump’s own draft deferments (he had four deferments total). But while on The View Monday morning, McCain claimed that he wasn’t referring to the current president, who was deemed not qualified for service from 1964 to 1972. No, the senator was just talking about how the draft revealed yet another one of the disparities between high-income and lower-income folks. What I was trying to say is one of the great inequities of the Vietnam conflict was the lowest income Americans went and fought and were drafted and those where were wealthy enough to have a doctor to say, “Hey, you got a bone spur or you got migraines” or whatever it is, then they were excused.